K.Y. Robinson is an introverted writer based in Houston, Texas. She received a B.A. in journalism and M.A. in history from Texas Southern University. Robinson draws from personal experiences as a woman of color, trauma and mental illness survivor, and hopeless romantic. She has loved words pressed against pages since childhood, and has been chasing them ever since. When I began The Chaos of Longing around 2008, it was a series of unrequited love poems written after a failed relationship. After I saw that I was repeating the same patterns in subsequent relationships, I wanted to dig deep to get to the bottom of it. Why was I drawn to unavailable men? Why did I tolerate mistreatment? Why did I try to find love in loveless and lonely things? There was chaos within me--low self-esteem, the remnants of sexual trauma, and mental illness. They affected every aspect of my life. It affected the way I chose lovers and how I failed to love myself. 2. Is there any particular author or book that influenced you in any way either growing up or as an adult? As a child I would have to say it was Maya Angelou’s I Know Why The Caged Bird Sings. I could relate to young Maya’s struggles as a victim of trauma and racism. The honesty and imagery was astounding. It’s such an important book for me and girls who look like me growing up. 3. Is this your first book? How long did it take to start and finish your book? 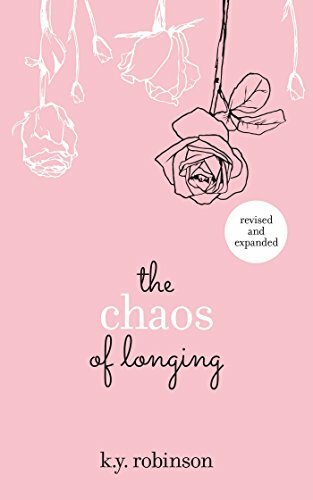 The Chaos of Longing is my first book. I began the book sometime in 2008 after a failed relationship. I struggled with the idea of publishing it for years and abandoned the project several times. But in 2014, there was a shift in poetry with the publication of Milk and Honey by Rupi Kaur. I knew after reading Kaur’s debut and salt. by Nayyirah Waheed that the world needed my voice too. 4. Do you write with an outline, or just let it flow organically? I let the words flow organically. Sometimes a line will come out of nowhere and I have to find pen and paper. I’ve often awaken from sleep just to jot down lines in the dark. It can be a terrible idea at times especially when I have words written on top of other words and can’t make anything out. 5. Do you listen to music when you write? If yes, is there a theme song for this book? Yes, I consider music to be one of my inspirations. This book delves into so much--trauma, mental illness, love, heartache, and healing so it’s kind of difficult to pin it to one theme song. A few artists I listened as I wrote the book were Tori Amos, FKA Twigs, Lana del Rey, Adele, Persia White, and Björk. 6. I know you sold 1000 copies of The Chaos of Longing as a self published author. That’s a success in itself. It’s difficult to sell poetry. What are the keys to success in getting your book out to the public? How did it feel when your manuscript was accepted at Mcmeel publishing? I never would have dreamt that the self-published edition would sell over 20,000 copies. That was surreal. When people ask about the book’s success, they assume it a secret ingredient that I’m withholding from others. I think it was a variety of things. I did book giveaways. Even though it was expensive shipping out free books, it help to generate book buzz. I created ads on social media. They were helpful because they reached users who weren’t following me or was acquainted with my work. I formed genuine friendships with other modern poets. I also built relationships with readers. There are times I’m chatting with a reader online for hours! I also felt like it was my time. After sitting on this book for years, it felt like the universe was aligning and finally giving a sista permission! I was very excited when Andrews McMeel Publishing accepted my book proposal. It was one of the goals I manifested myself. I just didn’t think it would come true so soon. 7. What advice would you give to new Poet/authors? This may sound cliche but just do it. You never know who you could touch or inspire with your words. Just be yourself and write from the heart. Don’t write just to appease the masses. 8. How about sharing an excerpt from The Chaos of Longing? “Elements ii” is my most shared poem on social media. It’s about self-love. In this poem, I come to the realization that everything I needed was inside of me the entire time. I had to stop trying to find myself in others. there’s a universe swirling inside you. I’m attempting to work on my second collection Water. With daily stress and the aftermath of Hurricane Harvey months later, it’s been difficult sticking to a decent writing schedule. 10. Where can readers find out more about you and your book(s)? 11. I believe you have a rare talent I absolutely love The Chaos of Longing. Have you considered mentoring less seasoned poets? Thank you so much for the compliment. I don’t know if I’m ready for such an undertaking. I’m only one book in. Ha! I would like to have more experience under my belt before I feel comfortable doing so. I want to do it right. Charles Stokes the Author of Love Pain & Poetry can be followed on Goodreads using his name, book title or clinking the link provided. Writer's like Robinson have a lot to offer aspiring poets in lessons learned. She shares with us here that she's sold 20,000 copies self published. Many authors want the how. Poetry is really difficult to sell and before Milk and Honey debut those type of sales were rare. Maybe with enough engagement our readers will convince Robinson to do a guest blog on how. I know I'd love to read it. Follow her, buy her book and maybe she'll share her marketing strategies in detail. Love Pain & Poetry recommends this book. Emerging writer delivers powerfully in her first work.